I think that calls for some delicious and beautiful cookies, don't you? 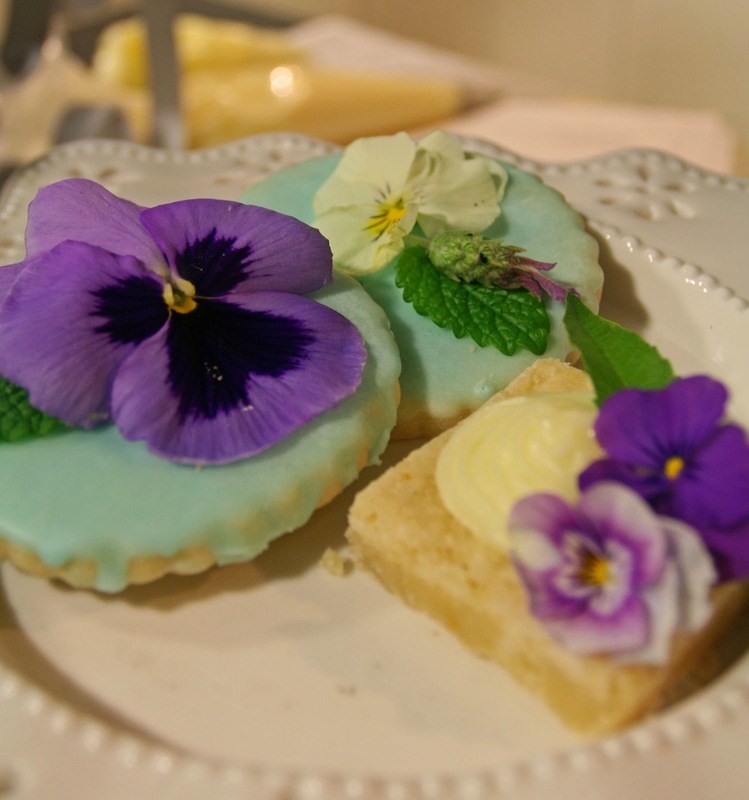 And how about we REALLY enjoy those pansies on our cookies...because, YES, they are edible! (and they really don't have a flavor, especially the small ones). Well, you're in luck. Today I have pictures and directions for how to make all these beauties! 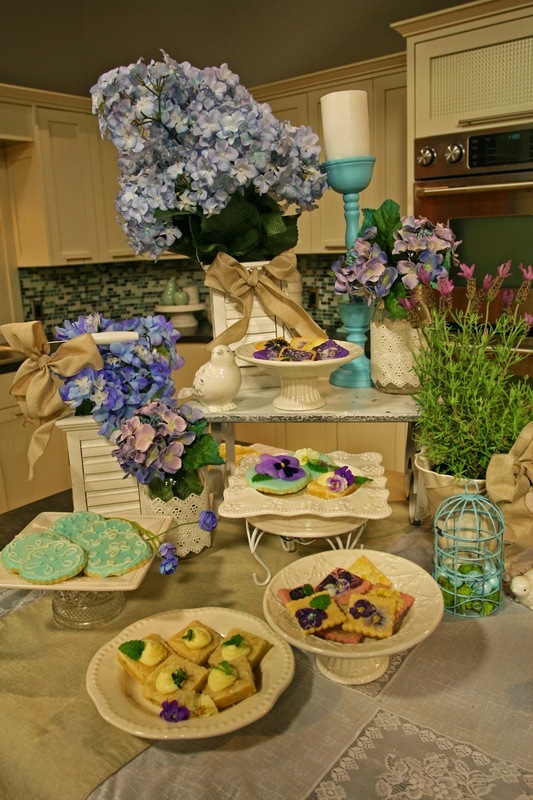 This setting is at the KSL TV Studio kitchen, where I demonstrated this cookies last week. I was given the opportunity to come on the show again, and I was thrilled. The host, Brooke Walker, is really quite a woman and I am always so impressed with how she handles her entire show. It's such a fun thing to be able to go and do segments with her! The entire staff is wonderful to work with as well and they make it so comfortable for their guests! You can watch the TV Segment Online HERE! I made 3 kinds of Cookies for this segment: Sour Cream Coconut Frosted Cookies, Lemon-Thyme Bars, and Vanilla Bean Shortbread Cookies. All of them are decorated in a different method, but each of the bases can take on a different look by mixing up the toppings, if you choose. Here are some more close up pics, and the recipes can be found HERE on my food blog. ENJOY! 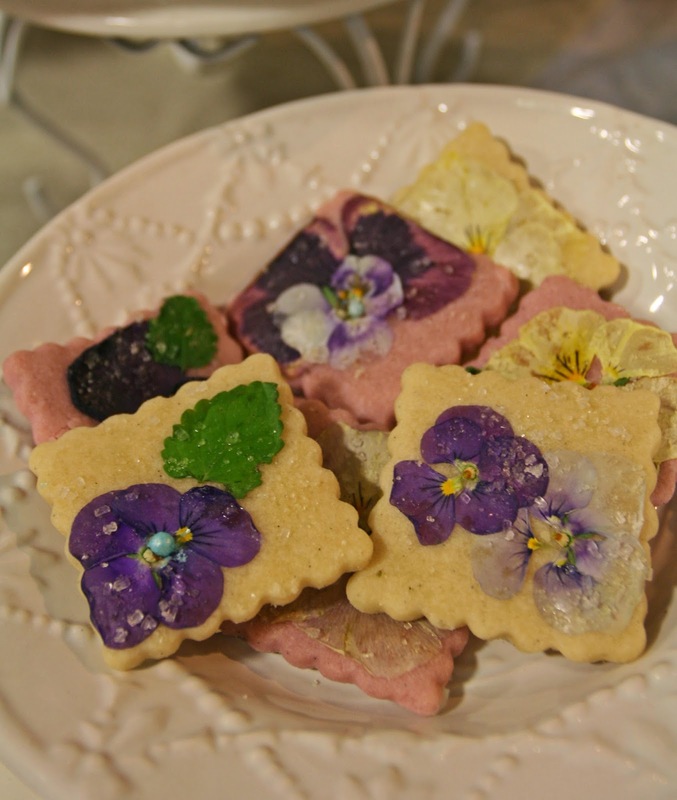 Two versions of the "Pressed Pansy Vanilla Bean Shortbread Cookies". For a complete list of Edible Flowers and other herbs, this website has every thing you'll need to know! On the top picture, I used a liquid food coloring to get a pale fuchsia color, and in the bottom pic, I used a purple paste coloring. There was quite a difference in the tone and depth of color and saturation between the two. I think next time I make these, I will go for an in between mix. I do like how both of them look, but somewhere in the middle will be my favorite tone. Directions for how to apply the pansies and sugar to follow. Also below is more info about this type of shortbread vs. the other type I am sharing. This next pic is a different variety of toppings on the Sour Cream Coconut frosted cookies and the Lemon-Thyme Bars. This is just showing that you can use pansies and other edibles on top of cookies and sweets without having to adhere them like they are on the shortbread. These aqua beauties below are some of the MOST delicious Frosted Sugar Cookies you will ever try. Ever. In your WHOLE life. I'm not kidding. 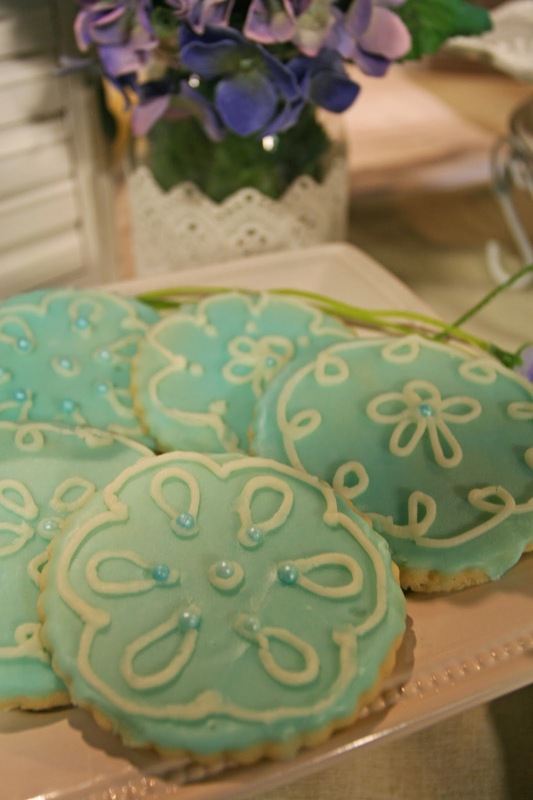 I also shared this recipe in my post from my food blog for Heavenly Easter Cookies. I never even bother making another kind of cookie, but this time I also added Coconut Oil to the cookies as well as the frosting. Oh. my. my. my. THE BEST. Please try them, they are wonderful! (with or without the Coconut Oil, but I highly recommend the change). I was going for a "lacy" look...you could re-create them however you choose. And change up your icing color. This was an equal mix of Kelly Green and regular blue. I needed a blue to pop with all the purple. 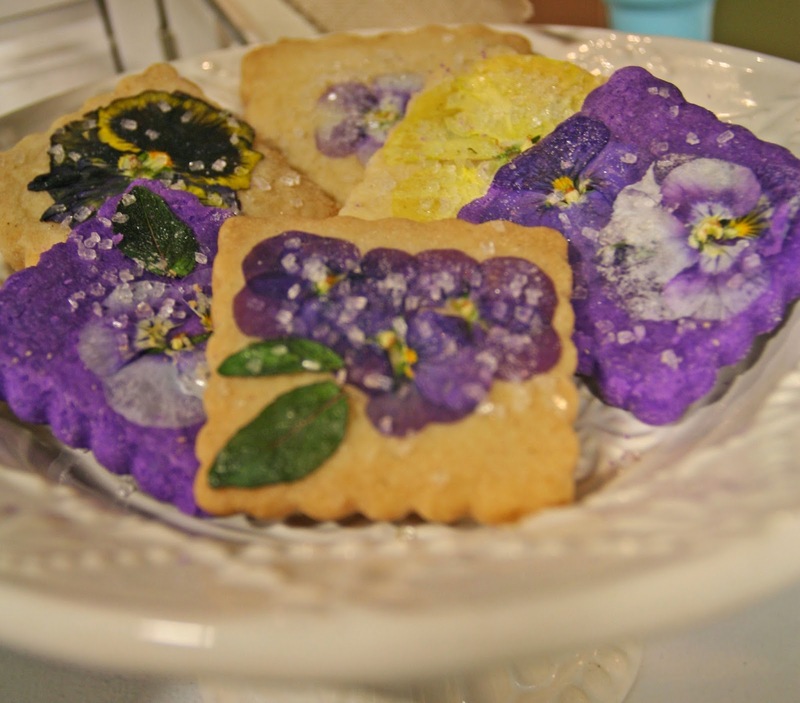 I also had some dragees that color, so I added them to the tops of these cookies, as well as to the center of some of my pansy cookies. So cute. 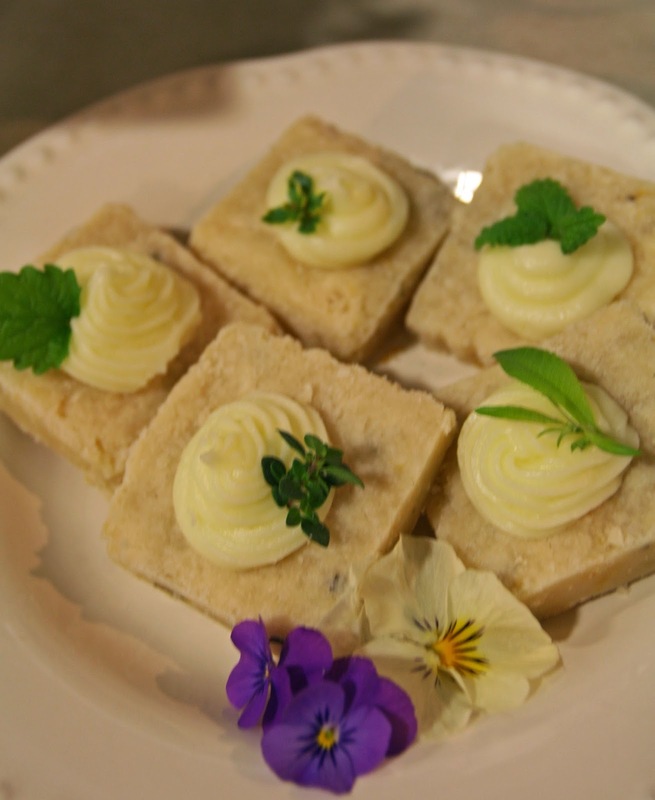 Now we come to our final sweet treat, which is the Lemon Thyme Bars shown below. I make this with fresh Lemon Thyme leaves, and it is a delightful taste. Please try it...you'll be blown away! I use Lemon Thyme for SO many things. I always grow at least 3 clumps in my garden areas, because not only is it useful for culinary purposes, it smells amazing and is a wonderful ground cover. I really recommend it. I also had brought along some other herbs to use this day, including another version of Lemon Thyme that is variegated, some Lemon Balm (which looks like mint) and some Lemon Verbena. I'm trying to use the verbena more often because it has a very mild flavor as well. The verbana have the longer skinny leaves. Let's talk about the difference between the two types of Shortbread for a minute. There is a big difference in the texture between these bars and the cookies above. The adjustments between the sugar and liquids, as well as the addition of the egg yolk and cornstarch make for a very big texture difference. Additionally, the lemon in the bars is a strong counterpoint to the butter in the bars. The cookies are a much more velvety texture, and the flavor from the vanilla bean paste is very strong, but equally as delicious. The bars won't stand up to a lot of handling because they are quite crumbly, but the cookies can take whatever you throw at them, while still maintaining a traditional shortbread flavor. I love them both. I hope you'll try both of them! The Vanilla Bean Paste is amazing and I will NEVER mess with whole vanilla beans again because of it! I use This brand, and I can often find it at my local Home Goods store for about half of retail price. When I do find it, I stock up! I never want to be without it! It adds the best flavor PLUS beans! It's wonderful! 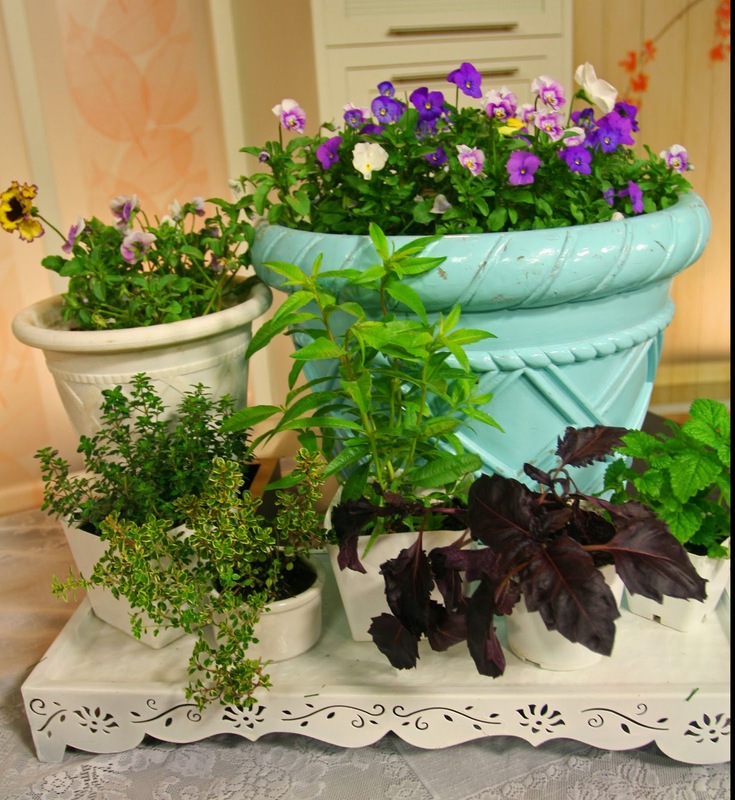 Here's the set-up of the Herbs I brought, as well as the pansy pots. 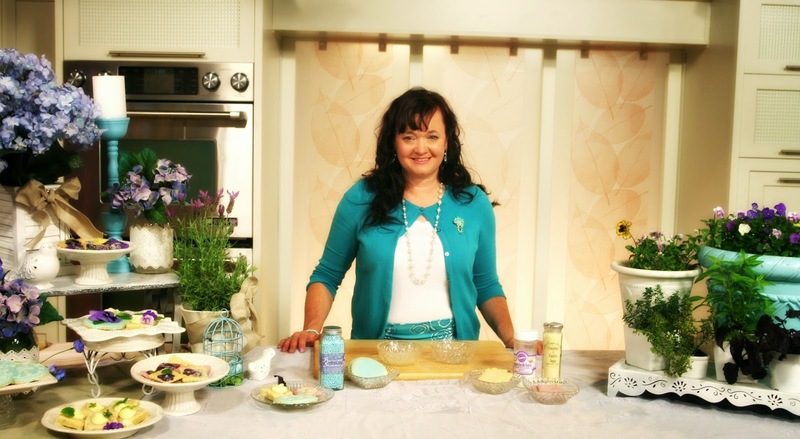 And finally, here I am in the TV studio kitchen with my set-up. I was really happy with how it turned out! Please feel free to comment and ask me any questions you might have. I always answer my reader's questions!